Up to date equipment is a must for equipping office and administrative premises, commercial facilities for creating a comfortable microclimate. After all, air conditioners for commercial buildings and premises are able to create a favorable temperature regime. That has a beneficial effect on the efficiency of employees, their healthy stay in the rooms and positive thinking. Shopping centers are usually full of people. For comfortable stay in the shopping area, shopping centers use chiller-fan coils. 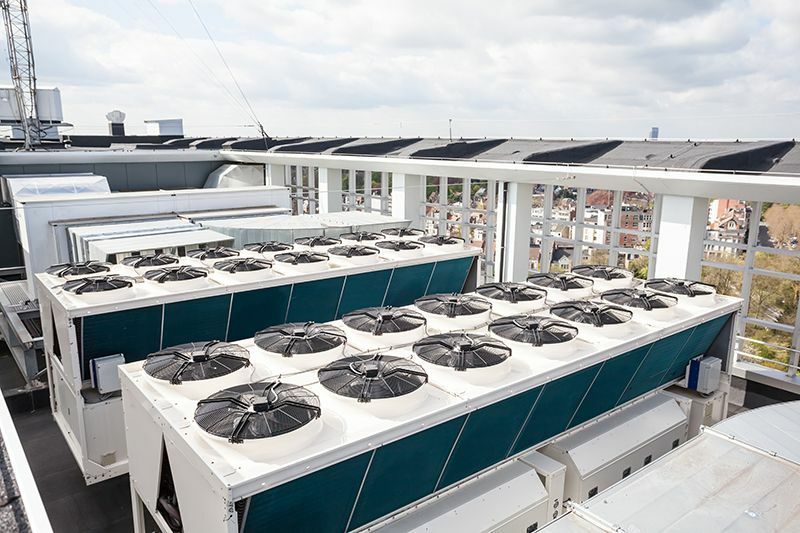 A large accumulation of refrigeration equipment, luminous windows, freezers, shopping racks leads to an increase in temperature, which is easiest to control with the help of special air conditioners, the so-called VRF. Often, in such buildings and warehouses a special equipment – rooftops used to create a comfortable microclimate. The selection of air conditioners for commercial premises requires certain knowledge. To choose a model of AC units, to calculate its technical capabilities it is necessary to have certain practical skills. For the services of highly skilled masters to calculate the technical capabilities of modern split-systems, you must fill out an application. Our engineers will find the best air conditioning option for any commercial space. Our company carries out repair and service of air conditioning systems in commercial and industrial premises in Santa Barbara. Various types of commercial AC require wide and various scope and time of works. For a complete list and cost of services for your air conditioning system, please contact us. We will provide you with all the necessary information. The maintenance frequency depends on the type of air conditioning and the specifics of its use, and recommended to the client accordingly. If you have a problem with the system, our specialists (1-2 people) will come to you for the diagnosis. They will determine the cause of the malfunction and the place of breakdown of the equipment. They will also provide a diagnostic report, where they will indicate the possible causes of AC failure and the repair procedure (necessary components and work). We have enough experience in repairing AC systems in homes and cottages, in offices and shopping centers, in industrial premises. We work with world brands: Daikin, Toshiba, Mitsubishi Heavy, Mitsubishi Electric, Panasonic, Hitachi, Electra, Gree, Samsung, LG and others. High qualification of service engineers (regular training on equipment of various brands, availability of certificates). Partnership with air conditioner suppliers of various brands. Experience in the market of providing service and with air conditioners from various brands. In case of emergencies, we provide prompt response and prompt repair. We work 24 hours a day in Santa Barbara and the surrounding area! Quick response is our main advantage! The company A+ Refrigeration Heating & Air Conditioning has been providing repair services for climatic equipment for 12 years already. Choosing our professionals, you will get speed, flexible prices and high quality work. The minimum downtime of faulty equipment is our priority. Please contact us and repair of the commercial air conditioning will be performed at the highest level.